A Lamborghini Gallardo has crashed beyond recognition in Bangkok, after its driver lost control and ended up on the side of the road. 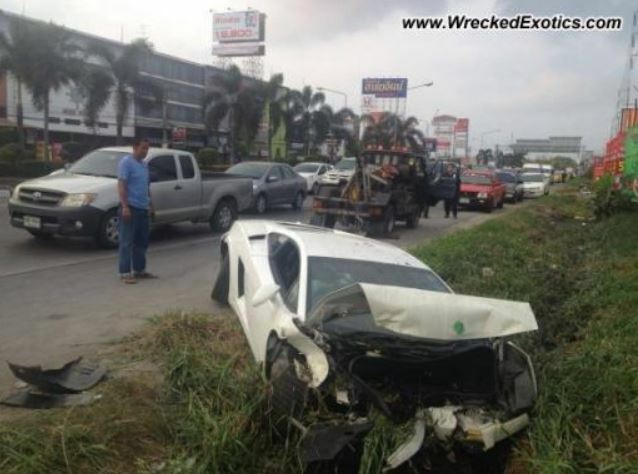 This is not the first time a Lamborghini meets its end because of speed or driver`s lack of experience, as it was also the case of another Aventador being scratched by a truck in the same Bangkok. This time the Lamborghini Aventador ended up into a ditch in front of a restaurant, after the driver lost control because of speed. As it can be seen in the photo, we don’t know if there were any injuries with the driver or any passers-by, but it is more than sure that the supercar will end up being sold piece by piece. The Lamborghini Gallardo was recently replaced by the fresh unveiled Huracan, as it used to be manufactured in Sant`Agata Bolognese, coming in two bodies, a coupe and a roadster. The supercar also came in two layouts, mid-engine, and an all-wheel drive, as well as a mid-engine and a rear-wheel drive. The Lamborghini Gallardo used to come with a 5.0-liter V10 or a 5.2-liter V10 engine, mated at a 6-speed manual or a 6-speed E-Gear automatic.